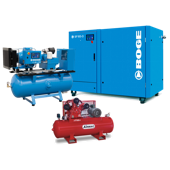 BOGE converters offer an entirely new alternative to produce absolutely oil free quality class 0 (ISO 8573-1) compressed air. 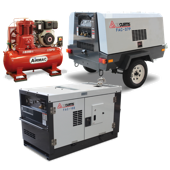 They are cheaper in terms of procurement and operation costs compared to traditional oil free compressors or conventional treatment systems and provide absolutely safe operation. Owing to the innovative BOGE catalyst system, only completely pure condensate is formed – absolutely environment friendly. The BOGE converters BC 5 to BC 130 HP stand for high operational safety. Oil penetration is impossible no oil can be discharged into the compressed air. Their installation directly downstream after the compressor makes them simple to install. Service life is 20,000 operating hours, at minimum maintenance and without filter replacement. This is because the BOGE converter does not use any filter! 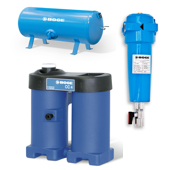 The condensate which is discharged from the BOGE converters is oil free and, in relation to its oil content, even meets drinking water quality requirements. Therefore, there are absolutely no disposal costs for the condensate. BOGE converters stand for efficient operation: with an extremely low energy input of approx. 5 Watt/m³. There is no filter related compressed air loss so that unnecessary higher compression is avoided.